“I’ve been trying to really take a step back from the traditional rock musician thing,” said Adam Green. The musician's tour this fall, one of dozens since making a name for himself in the New York indie scene in the 90's, is definitely untraditional: Each concert starts with a screening of his film Adam Green’s Aladdin, after which Green will take to his set-designed stage in the bell-bottomed costume from the film, bringing the soundtrack alive. In short, it’s a real-life execution of a movie-turned-art-show-turned-album, which Green refers to as “a community project, because everyone did things for free.” The idea — a film starring himself and a genie lamp that doubles as a 3D printer in one of his favorite childhood stories — started at a dinner with Natasha Lyonne in New York, and was further improved during a downtown shopping trip where he bought a lamp with Alia Shawkat. Over the next few years, he wrote the screenplay on planes and in hotel rooms while on tour, eventually turning to Kickstarter for funds and friends for his cast. In Green’s case, those friends happened to be Lyonne, Shawkat, and Macaulay Culkin. Green was propelled into fame somewhat belatedly, when the 2007 film Juno featured music by The Moldy Peaches, his anti-folk group with Kimya Dawson, years after they’d disbanded and both gone on to their own solo careers. But growing up in New York, he was always surrounded by talented, recognizable faces — Culkin is one of his best friends and primary collaborators. The two have an art collective with the musician Toby Goodshank, and Culkin also starred in Green’s first film, 2011’s The Wrong Ferrari. Also featuring Pete Doherty, Devendra Banhart, and Sky Ferreira, The Wrong Ferrari was shot entirely on Green’s iPhone, partly to drive home his thesis that life is a video game, and partly because it was “the only camera I knew how to use,” Green said. His character meanders through Prague and Venice, and ultimately signs to a label called Nintendo Records — the same made-up label that his titular character in Aladdin signs to, too. In a way, Aladdin is a follow-up to Ferrari — an anti-technology meditation on “feeling like your soul is sort of being ripped out of your body by machines that are possessing your soul,” Green explained. This time, the storyline came with a rebel leader (played by Culkin) and a Bitcoin-like currency. Lyonne plays Green’s mother; Shawkat, his sister; and the artist Francesco Clemente, a childhood hero of Green's, the genie. The film's scenes are entirely dream-like, though not all of it is made up: Like his character, Green was dropped from his long-time label in real life, and did meet the woman who became his wife in the process (Yasmin Green is also of the film's producers). Green spent years dreaming up Aladdin, and constructed its set entirely by hand. The papier mâché sculptures and forms were so detailed and imaginative that they got their own exhibition at The Hole gallery in New York; for visitors, it was like walking into “a real-life cartoon.” Although Green openly says he “really committed to the ketamine trip” with The Wrong Ferrari, to the point that he even took the drug at the film’s screenings, the creative process was different for Aladdin: he didn’t take any “major” hallucinogens, he said, and is growing somewhat resentful of the skeptical reception his openness about his drug use has earned him. But if it does earn him the reputation of being a little crazy, that seems fine with Green, too. “I mean, I am crazy, but maybe not in the way people think. I try to understand what subconscious imagery comes to me, and I try to document it,” he said. 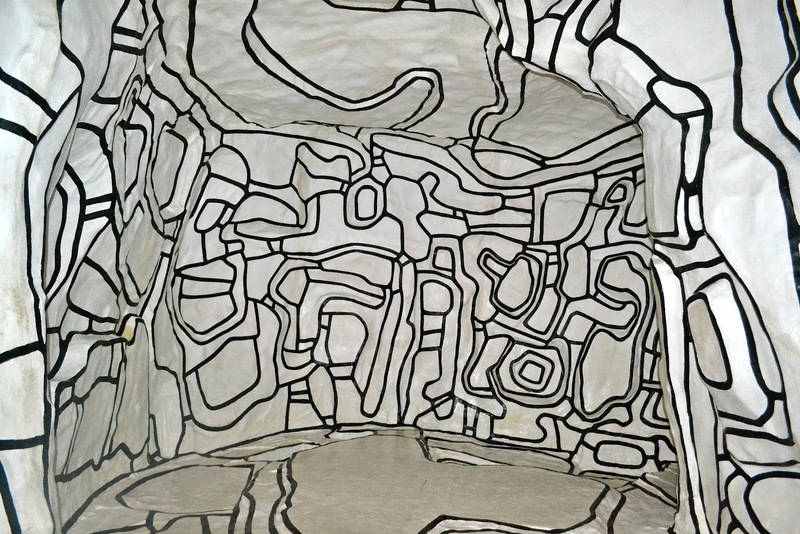 To construct his Aladdin universe, he used “cubic reductions” of Garfield, Elmo, and Super Mario Brothers as building blocks, though they’re abstracted mostly beyond recognition, defined by black lines that mirror one of Green’s inspirations, an installation by the French artist Jean Dubuffet that Green saw at the Centre Pompidou in Paris. “I’m making a world out of shapes that I’m familiar with, and I’m using those things as hooks to climb a mountain,” he said. I asked if the film shows what’s really inside his mind, and he misheard me, maybe fortuitously: “Is there a reality show inside my mind?" he said. "Yeah, I think so."